IP Broadcast Advertiser delivers your message directly to the users' screen in a window, which pops up on top of all other applications and windows and ensures that your product will get seen ! IP Broadcast Advertiser delivers your message directly to the users' screen in a window, which pops up on top of all other applications and windows and ensures that your product will get seen. Additionally, while e-mail often takes several days to get a response, IP Broadcast Advertiser provides real-time interaction, and a user can respond to your advertisement almost immediately. Send messages right to the desktops of 1000 potential customers with one single click of the mouse. Instantly reach as many as 3.5 million people every day. Eliminate the hassles and delays involved with compiling large e-mail lists. Avoid laws and regulations regarding bulk email by sending anonymous and untraceable messages directly to the user's screen. Use IP information to target specific geographic locations. Why IP Broadcast Advertiser is the #1 way to market your business on the Web? Instant Messaging is easy! No need to collect email addresses, no need to keep mailing lists, no need to run the gauntlet of opt-in/opt-out email problems. IP Messaging is perfectly legal! Unlike bulk e-mailing techniques which are regulated in many countries, instant messaging is not restrained in any way. Instant messaging technology is not for Spam and should be used only to communicate with computers for which you have an IP address. Responses to the messages delivered by IP Broadcast Advertiser are instant. As soon as the message is sent by the software it appears on the screen of the recipient's computer. Advertising has never been so simple! 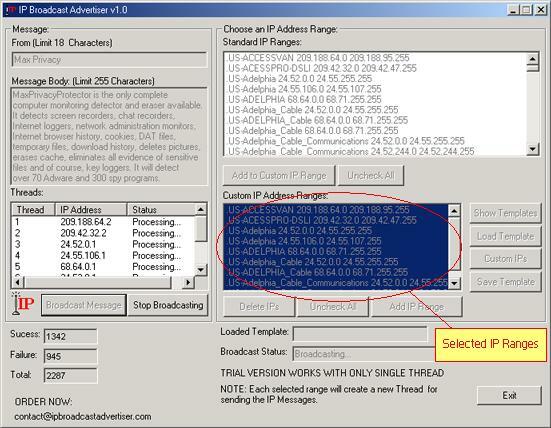 Our program never shows your IP address anywhere. The messages sent by the Mailer are completely anonymous and virtually untraceable - unless you identify yourself otherwise. Response rate is a lot higher than any other marketing method, which means more business for you. PYSoft Broadcaster - Brodcast Video Audio content, You can broadcast from anything that can plug into your audio or video card. SuperFax: Fax Automation Utility - An faxing software add-on for Word automates faxing, using any fax program on the market. The StarMessage Diary - An excellent way to keep a personal journal of day to day thoughts, feelings, memories, dreams, ideas and important events in your life.